Note: This is a review of the 2016 model. The 2017 model seems to be even better, and Starboard improved various aspects of the board. 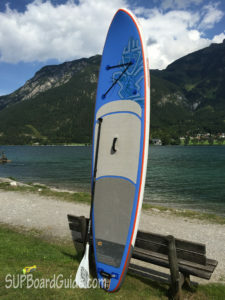 I linked to the 2017 model below, and you currently get a free fiberglass paddle with the board and $75 off if you use the coupon SUPBOARDGUIDE. There are some pretty good inflatable SUPs flooding the market and giving the hardwood varieties more than a good run for their money. I have been on an inflatable bender lately, trying and testing some of the boards that have piqued my attention. 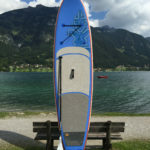 Regular readers of SUPBoardguide.com would probably remember some of the SUPs I have reviewed, including the Solstice Bali, Tower Xplorer, and iRace. 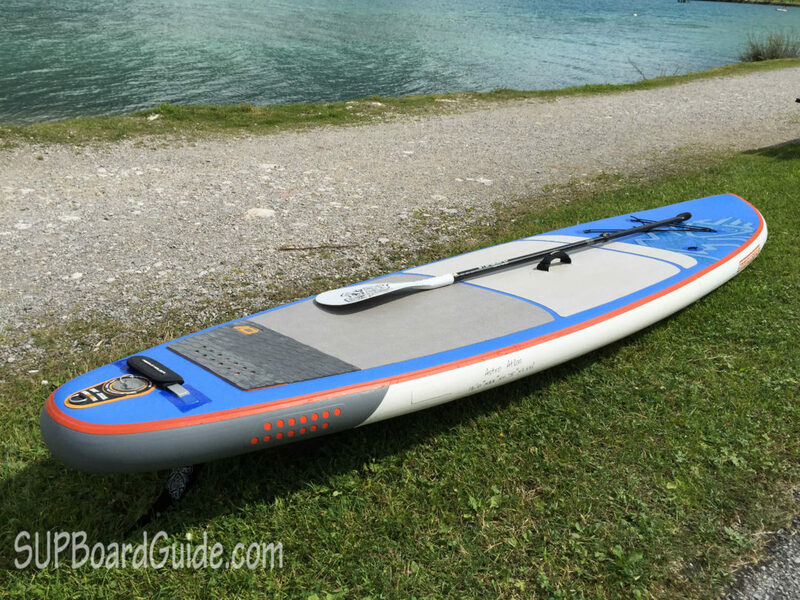 Today I have for you the Starboard Astro Atlas Zen Inflatable SUP. This board has caught the attention of our community, not just for the board itself, but also for the accessories that come along with it. Starboard seems to be a SUP company whose star is on the rise. They have been releasing a stellar line up of hardwood and inflatable boards each year, continuously working and improving on earlier models. They have released two models which are kinda similar to one another: The Astro Atlas Zen and the Astro Atlas Deluxe. My focus is on the former. At first glance, the Zen seems to be everything that has been said about it. The board feels like a true all-rounder that you can use for a variety of purposes. You can take it out for a short cruise on the lake, or get the adrenaline pumping by racing it on the flat water. 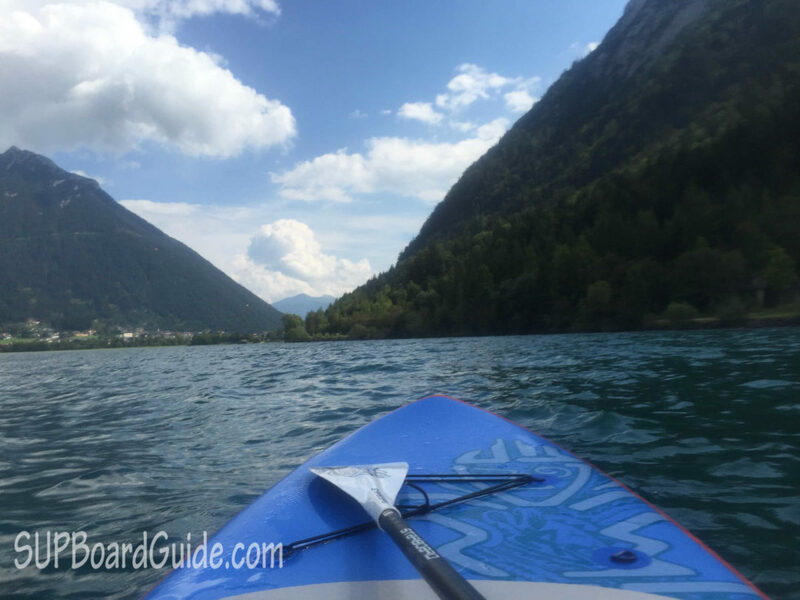 If you are in the mood for a long paddle, you can spend a few hours touring on the board. For the adrenaline junkies, the inflatable SUP performs admirably on waves and in the open ocean. The one thing that the Zen gets absolutely spot on is its tough build. 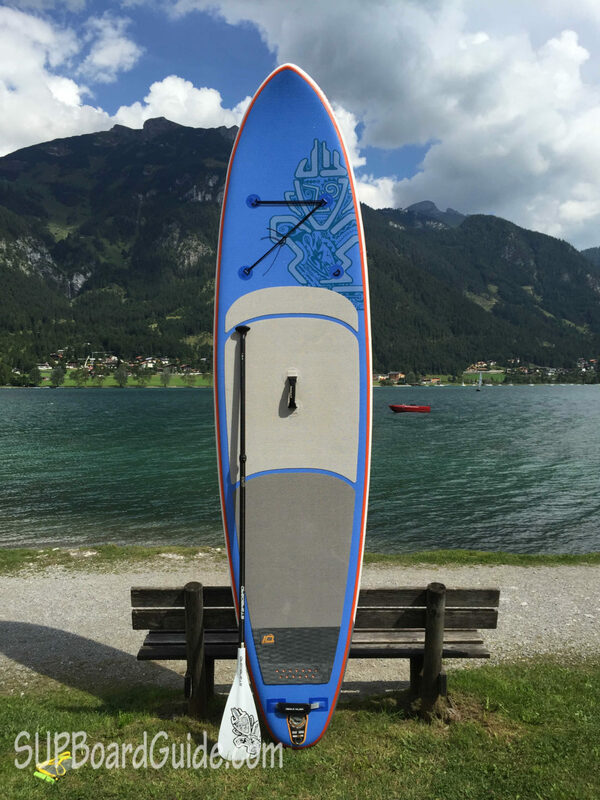 Being an inflatable board, there are always concerns whether the SUP can maintain a solid base. The Astro Atlas Zen certainly can because of its superior build. To start off, there is the 4.75-inch drop stitch construction that gives the board a thick, stable core. Then you have a double layer PVC laminate that forms a durable skin over the inner core. So far, so good. Where I feel that the Zen is slightly ahead, compared to its competition, is the 2+1 Rail Band feature. You will find an airtight inner Railband that keeps everything nice and tight in the interior section. Next is an outer Railband that is thick and adds to the toughness of the SUP’s body. The third Railband sits on top of the board, acting as a strong compressor. Starboard has gone a step further and wrapped everything up with heat resistant glue. What this means is that you can stay out longer in the sun without worrying about the Zen heating up. Even from an objective point of view that is mighty impressive, I must add. Talking of comfort, your feet will find the croc skin-textured deck-pad a soft, firm platform to stand on. Even after you spend hours on the SUP, your feet remain energized. The Astro Atlas Zen stands at 12 feet, which cuts quite an imposing figure. But don’t let the dimensions of the board fool you. 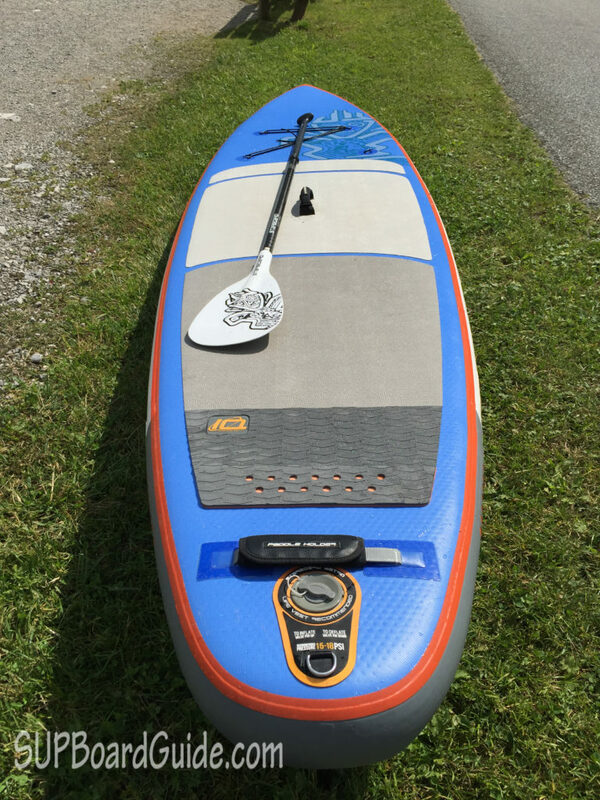 Once on the water, the Zen feels light and easy, allowing you to glide further with a single paddle stroke. 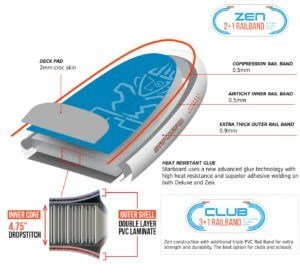 The reason for the board’s enhanced glide lies in its shape. The SUP tapers nicely to the front and the rear as well. 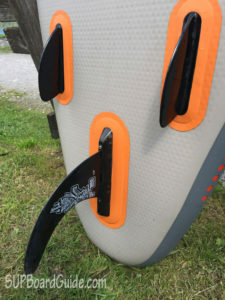 This is not common to the inflatable boards, such as the Solstice Bali and the previously mentioned Xplorer, that either have a tapered nose or tail. With the Atlas Zen featuring a smooth oval shape, the board streamlines through the water surface with a minimum of fuss. I’ve tested a ton of boards, and this one is one of the better cruisers out there. 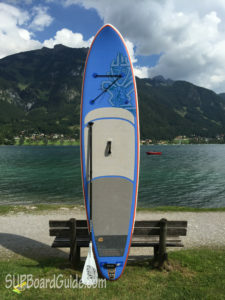 At times, it is easy to talk about the how a SUP is built, how it performs, and other aspects of it, while forgetting the effort put into its visual design. The Astro Atlas Zen sports a sleek, minimalist look that will get your attention. You have a block of blue that colors the front of the board with an embedded image of a Pacific figurine. Light grey demarcated with curved blue lines dress up the middle and the tail of the board. A thin line of orange runs around the rim of the board providing an eye-catching contrast. Now, this is where things get interesting for Starboard’s inflatable SUP. The reason the board turns out a good performance in varied conditions is because of its fin set up. It is a traditional 2+1 arrangement, with a large, detachable central fin and two smaller fixed fins. With the large fin on, the Zen tracks in a smooth, straight line in flatwater conditions, which makes the board such a good touring option. You will find that a minimum of effort is required in keeping the board in a straight line, going forward. When the time comes to take on whitewater challenges, simply remove the large fin. The two smaller fins enable the Zen to cruise through the open ocean and even take on small waves. 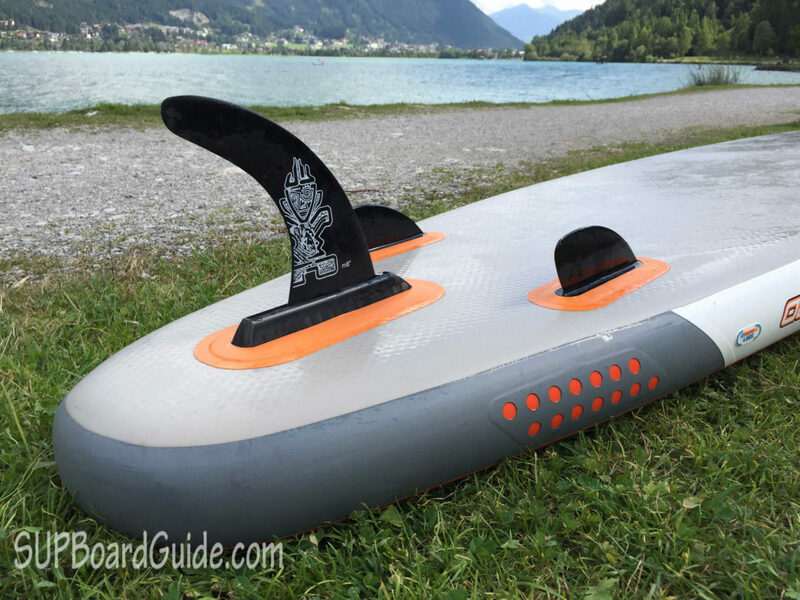 Put the large central fin back on and you can even take the SUP for a sprint across the lake. Most boards, whether inflatable or the hard variety, get the basics and big details right. It is the finer details that set the good boards apart from the ordinary ones. The Starboard Astro Atlas Zen certainly has its basics in place. What it does really well is getting the finer details right too. For instance, the slight lift in its nose that allows the board to maximize its aerodynamic shape for touring and speed. Then you have the bungee cord attached to the front of the board, which makes perfect sense. The Zen is a tall, thick board, and you can carry a nice lunch or additional equipment with you while cruising the river. One particular detail that I personally loved is the neoprene paddle holder at the tail of the board. You can simply dock your paddle as you carry the board around or get your daily dose of yoga on the lake. I have always had a beef with the below par accessories provided with inflatable boards. The Zen kind of outperforms other boards in this regard as well. Starboard includes an impressive carry bag to go along with the board. The bag has wheels to drag it around, and cushioned shoulder straps if you prefer to carry it. With non-corrosive zippers and a resilient outer body, the carry bag allows you to travel with the Zen with ease. Talking of accessories, one notable item is missing the paddle. I feel it is an issue because the price point of the Zen is on the higher side. For the money that you spend, you should probably get a free paddle as well. The other area where I felt the board is a bit of a let-down is the width. At 30 inches, the inflatable SUP can feel a bit narrow for beginners, the Zen’s target audience. It may take a while to get really comfortable on the board. In this regard, the Astro Atlas Deluxe, which is similar to the Zen offers a 33-inch wide body. If you are on the shorter side as far as height is concerned, then the Zen may not be the best option for you. At 12′ the board is not the easiest to maneuver, and shorter riders may just feel the board a bit too much to handle. Starboard’s Astro Atlas Zen is, no doubt, a very good option if you are looking for a lightweight, portable, all-around board. The Zen can be used in a variety of conditions, which should definitely appeal to beginners. The board offers solid stability, enhanced glide, and good speed. I feel the board is a jack of all trades but a master of none. Nice review will be looking forward to buy this board on the holidays!